"Where The Humans Are The Accessories"
Pet Couturier Anthony Rubio, no stranger to the runways had a plan in place to break the stigma and barriers presenting his canine couture as escorted by human models wearing his women's wear fashions at the fabulous location Gotham Hall by Style Fashion Week during this season's New York Fashion Week. Many of the canine models are Instagram famous dogs, while others have interesting stories. Meet Little Bean, a Sato, just a few weeks ago he was homeless roaming around the streets of Puerto Rico. 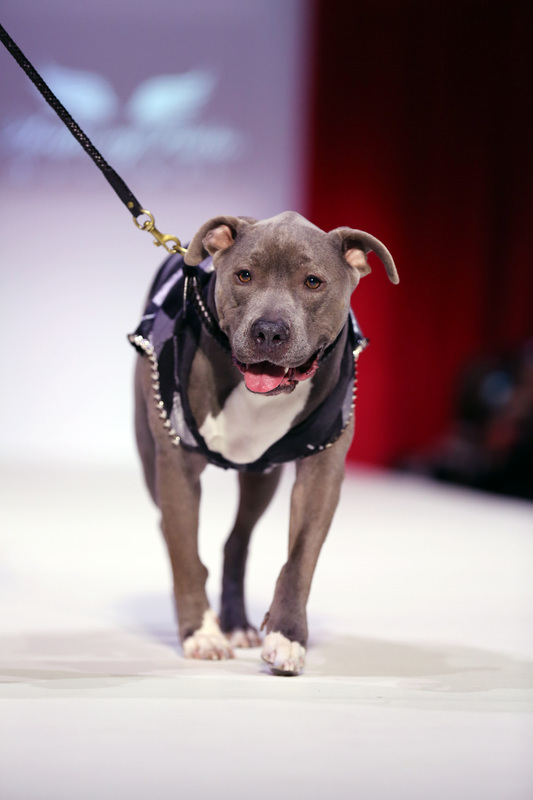 With the help of Animal Lighthouse Rescue, pulled from a shelter and now a fashionista walking the runway at New York Fashion Week. Little Bean was adopted later that day. Remember, all dogs are precious and deserved loving homes. Adopt Don't Shop. Thank You Julie Sinaw and everyone at Animal Light House for the amazing work they do on a daily basis, said Rubio. This is Henry. You may recognize him. He was rescued from Bideawee who became the poster dog for their adoption campaign including a huge billboard in Times Square. Chase is a Pitbull, the breed sometimes gets a bad rep. Anthony wanted to showcase the Pitbull in a cooler image. Chase was a shelter rescue and roam free backstage for everyone to enjoy. On my recent trip to Italy I had the privilege of a private viewing of the works of artists like Michelangelo Merisi da Caravaggio, Raphael, Dosso Dossi and Jacopo Bassano at Galleria Borghese. I was at first taken by the rooms and the elaborate decor and the richness of color. The paintings drew me in to get a closer look and study of depth and contrasts. I noticed so much darkness surrounding the saturated colors. This was what inspired the choice of colors for my collection. At first I chose textiles in these colors that had just the right sheen and texture but that was still not enough. There was something more that needed to be done to bring the depth to the forefront. I studied the art work and when shopping for the fabrics came to realize that I was not bringing in enough black or darkness. Then I had a moment of enlightenment realizing that to capture that depth I would have to layer the fabrics. I chose to layer dark sheer netting over the bright saturated fabrics in this case shantung and it actually worked. As a designer I knew that I had to leave my audience with a lasting impression. The last piece had to bring that 'Wow' factor. I chose to do a huge over sized ball gown with a contemporary feel. I wanted to recapture that old fashion way of closing with a wedding gown but at the same time I did not want it to be an actual wedding gown. I stumbled upon this rich Navy blue sequined sheer fabric which has metallic gold embroidery. I knew right away that this would be the show stopper. To achieve the depth and volume I used layers navy organza which was also used for the train. I crated a simple three quarter sleeve top with a scooped neckline and attached an applique I made from the very same sequined fabric on the skirt. That made the entire look more contemporary and less stiff. The end result was that magical gown which stole everyone's breath away as it seemed to glide down the runway. 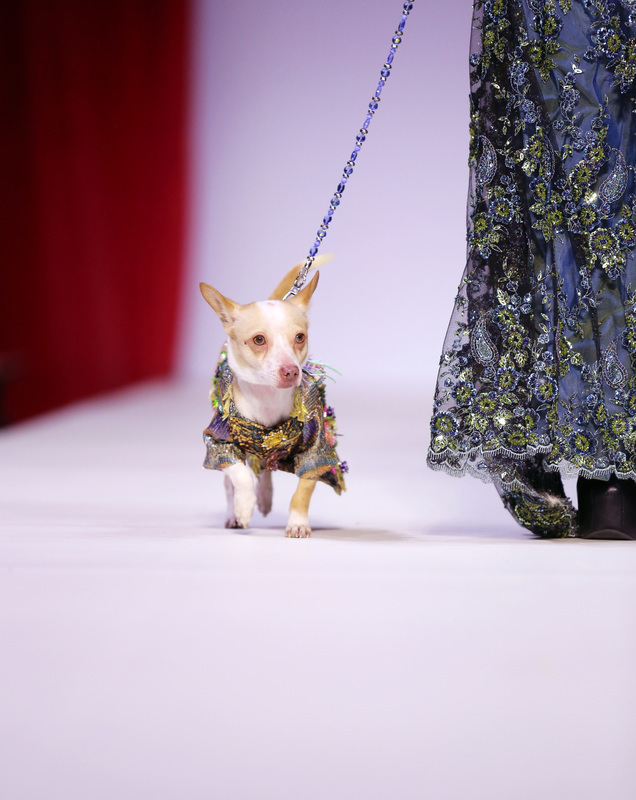 Chihuahua Bogie wore a robe of many rich colors which I decorated with tiny metallic autumn leaves. The collar of this robe was jeweled in crystals and amber. Anthony Rubio wanted to introduce his canine couture creations at NYFW, but not as a gimmick, he did not want it to be the typical runway show. Anthony did not want the dogs to appear as accessories. "In my world the humans are the accessories" said Rubio. Americans spend a record 56 billion dollars on pets last year. We see our furry four-legged cuties as family members. As the proud care taker of two Chihuahuas Bogie and Kimba, he would be the first to say that he does not own the dogs, they own him. With that in mind Mr. Rubio decided that it was time for the dogs to give fashion with the humans as the accessories. Born and raised in New York City, Anthony Rubio will be celebrated 10 years this past October since starting Anthony Rubio Designs and is the most accomplished designer in Pet Fashion.